MAMIDIKAYA PULIHORA:Summer..being a season of mangoes,we can do this recipe instantly within half an hour. Pressure Cook rice first.The rice and water should be in the ratio of 1:2. Meanwhile,place a pan on the stove,add oil to it.After the oil is heated, add channa daal,urad daal,ground nuts,redchilli slits,mustard seeds ,methi seeds etc. one by one ,saute well..let them fry to medium brown colour..
Lastly add green chilli slits,and curry leaves,then switch it off,after 1 min,take care while frying the curry leaves,coz they will splutter. 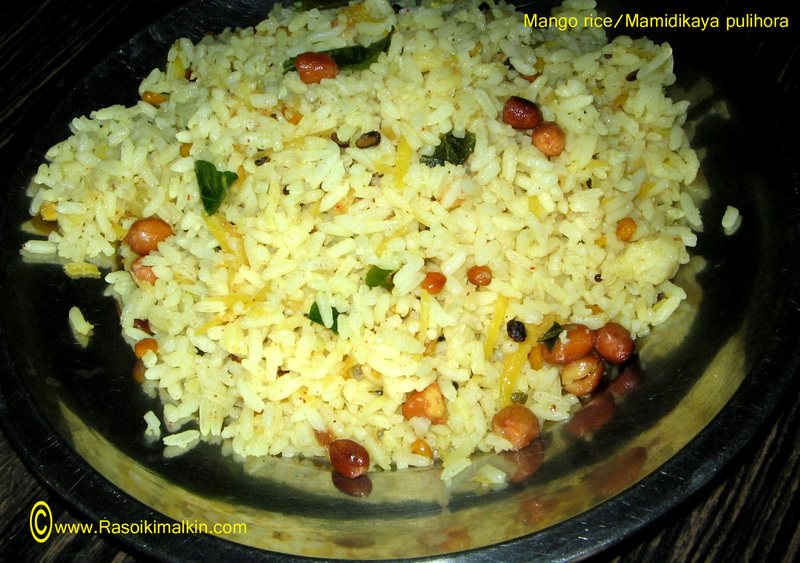 Add the grated mamidikaya ,haldhi,and salt with the cooked rice, mix well according to your taste.If you want less sourness add less amount of grated mango,but if you want it more sour and tasty,add more qty of grated raw mangoto the cooked rice. Lastly add the total seasoning to the rice.And mix it well.Mango pulihora tastes yummy. If you want to store it for a day i.e. both for supper and dinner also, then fry the grated mango in 1 tsp of oil for 5 mins in medium fire,saute well then switch it off.And after it turns cool then add into the rice.Like this it will retain for 1 day in indian atmosphere. I prepare this atleast once a week in the season of mangoes. This is one of our family favorites! And i love that tangy tingling taste raw mango brings to it!! I soooo love the tang of raw mangoes in recipes--lip-smacking rice! it gives me a kinda... poha feel..
with all those spices and peanuts..